Medieval Greek marriage and family life. The Byzantine Greeks (or Byzantines) were the Greek people of Late Antiquity and the Middle Ages. They lived in the lands of the Byzantine Empire (or Eastern Roman Empire) like Greece, Asia Minor and Cyprus. They spoke medieval Greek, preserved Greek culture, obeyed Roman law and followed Eastern Christianity. Their society had peasants, traders, teachers, soldiers and priests. 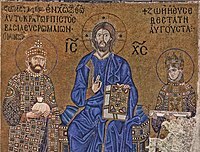 The Byzantines called themselves Romans (Romaioi), Greeks (Graikoi) and Christians (Christianoi) throughout their history. They used those names synonymously because they were the political heirs of the Roman Empire, the offspring of the ancient Greeks, and believers in Jesus Christ. The Byzantines also called everything that was not Greek "barbarian". 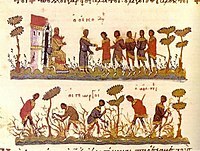 Byzantine Greek society had different classes like the poor, the peasants, the soldiers, the teachers, the merchants, and the priests. There were two groups of poor people in the Greek world since the time of Homer: the ptochos (πτωχός, "passive poor") and the penes (πένης, "active poor"). Byzantine Greek peasants lived in villages, drank wine and ate grains, beans, fish, bread and olives. They were hunters, fishers, bee-keepers, craftsmen, smiths, tailors and shoemakers. Soldiers were chosen for military duty every year and served as medics and technicians. Their appearance, customs, habits and life were part of a Greek and Roman military tradition. Along with farmers, they ate a type of dried biscuit bread called a paximadion (originally called a boukelaton). Byzantine education was part of an ancient Greek educational tradition that started in the 5th century BC. It was made up of three levels: 1) elementary school with students aged six to ten years old, 2) secondary school with students aged ten to sixteen years old, 3) higher education. Literacy was much higher in the Byzantine Empire than in Western Europe. Elementary school education was widely available in places like towns and the countryside. Secondary schools were mostly in larger cities and higher education was offered at the University of Constantinople. In elementary schools, teachers used simple fairy-tale books like Aesop's Fables. In secondary schools, teachers used ancient Greek texts like the Iliad and the Odyssey of Homer. The life of a Byzantine Greek woman was split into three stages: 1) girlhood, 2) motherhood and 3) widowhood. Daily life for women included doing household and farm chores. Poor women sometimes wore sleeveless tunics and most wore a veil called the "maphorion" that covered their hair. Wealthy women bought and wore silk fabrics and clothes with expensive jewelry. Some women worked as traders, clerics and teachers. Byzantine Greek traders were mobile and developed new methods of investing money like the "chreokoinonia". Byzantine Greek priests were close to the rest of society and were allowed to get married (except for bishops). ↑ Papadopoulou 2014, pp. 157–176; Niehoff 2012, Margalit Finkelberg, "Canonising and Decanonising Homer: Reception of the Homeric Poems in Antiquity and Modernity", p. 20; Harrison 2002, p. 268; Vryonis 1999, pp. 19–36; Runciman 1970, p. 14. ↑ Kazhdan & Constable 1982, p. 12; Runciman 1970, p. 14; Kitzinger 1967, "Introduction", p. x; Runciman 1970, p. 14; Haldon 1999, p. 7; Browning 1992, "Introduction", p. xiii. ↑ Ciggaar 1996, p. 14. ↑ Cavallo 1997, pp. 15, 17. ↑ Cavallo 1997, pp. 44, 49. ↑ Cavallo 1997, pp. 55–56. ↑ Cavallo 1997, pp. 76–77. ↑ Dalby 1996, p. 196; Kochilas 1993, p. 50. ↑ Cavallo 1997, p. 95. ↑ 13.0 13.1 13.2 13.3 "Education: The Byzantine Empire". Encyclopædia Britannica. Encyclopædia Britannica, Inc. 2016. Retrieved 16 May 2016. ↑ Rautman 2006, p. 282: "Unlike the early medieval West, where education took place mainly in monasteries, rudimentary literacy was widespread in Byzantine society as a whole." ↑ 15.0 15.1 Cavallo 1997, p. 96. ↑ Cavallo 1997, p. 119. ↑ Cavallo 1997, pp. 119–120. ↑ 18.0 18.1 Cavallo 1997, p. 127. ↑ Rautman 2006, p. 26. ↑ Laiou & Morrison 2007, pp. 139–140. ↑ Rautman 2006, p. 23. Browning, Robert (1992). The Byzantine Empire. Washington, DC: Catholic University of America Press. ISBN 0-8132-0754-1. Cavallo, Guglielmo (1997). The Byzantines. Chicago, IL: University of Chicago Press. ISBN 0-226-09792-7. Haldon, John F. (1999). Warfare, State and Society in the Byzantine World, 565–1204. London: University College London Press (Taylor & Francis Group). ISBN 1-85728-495-X. Harrison, Thomas (2002). Greeks and Barbarians. New York: Routledge. ISBN 0-415-93958-5. Kitzinger, Ernst (1967). Handbook of the Byzantine Collection. Washington, DC: Dumbarton Oaks. ISBN 0-88402-025-8. Kochilas, Diane (1993) . The Food and Wine of Greece: More Than 250 Classic and Modern Dishes from the Mainland and Islands. New York, NY: St. Martin's Press. ISBN 978-0-312-08783-8. Laiou, Angeliki E.; Morrison, Cécile (2007). The Byzantine Economy. Cambridge: Cambridge University Press. ISBN 0-521-84978-0. Papadopoulou, Theodora (2014). "The Terms Ῥωμαῖος, Ελλην, Γραικος in the Byzantine Texts in the First Half of the 13th Century". Byzantina Symmeikta 24: 157–176. http://ejournals.epublishing.ekt.gr/index.php/bz/article/view/3795. Rautman, Marcus (2006). Daily Life in the Byzantine Empire. Westport, CT: Greenwood Press. ISBN 0-313-32437-9. This page was last changed on 15 December 2018, at 21:56.